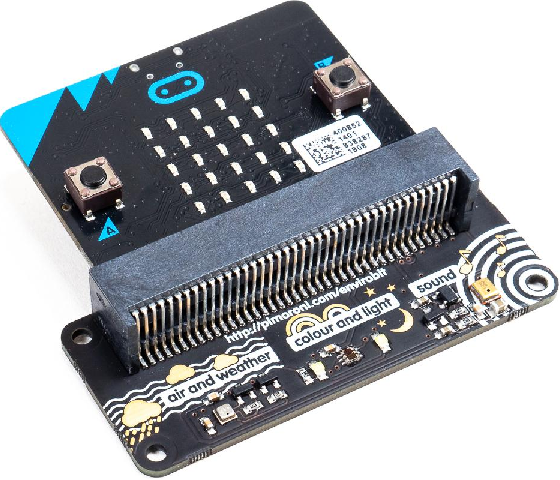 Pictured above is the new enviro:bit for micro:bit from Pimoroni – available for £20. This device has a collection of sensors which can add be read easily from Microsoft MakeCode Editor or directly via MicroPython for more advanced projects and programmers. There are three sensors in total. A BME280 atmospheric sensor which provides temperature, humidity, and air pressure measurements, a TCS3472 colour and light sensor, and a MEMS microphone for sound. The micro:bit simply plugs into the enviro:bit, and once you have added the required code library or libraries (for MakeCode Editor and/or Mu Code Editor) the sensors can be read, data collected, and displayed on the LED matrix etc. Click here for more information: buy enviro:bit from Pimoroni.